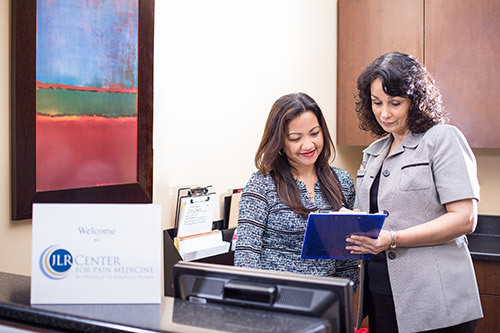 Named after Joseph L. Riley, MD, and founded in Orlando, Florida, in 1988, the Center for Pain Management is one of Florida’s largest physician-owned anesthesia practices, providing both anesthesia and pain management services throughout Central Florida. Recognizing the emergence of the field of pain management as its own specialty and the increasing need for physicians with specialized training and skills dedicated solely to caring for complex pain conditions, JLR established its Center for Pain Medicine division in 2007. Over the years, we have carefully grown our pain management team, recruiting only physicians who share our patient-centered approach and who trained at the most respected universities and hospitals throughout the country. Today, we have 10 board-certified physicians in nine locations throughout our community. As the field of pain management continues to evolve, with new treatments, techniques and technology available every year, our highly-trained and experienced physician team stays on the leading edge of these developments, offering you access to safe, effective and comprehensive care for your individual needs. In January 2014, JLR Medical Group became a founding partner in U.S. Anesthesia Partners, an anesthesia-focused physician services organization. This has allowed our physician team to collaborate with other leading anesthesia and pain medicine groups, sharing best practices, improving our collective clinical performance, and increasing the level of service we are able to provide our patients. Our mission is to provide high quality, comprehensive, individualized care to enhance our patients’ quality of life. We will be the leaders in the pain management field, defining best practices and serving as the primary pain management resource for service and education in the communities in which we practice. We value being able to provide excellent, skilled care, to the best of our ability, with professionalism, good judgment and integrity. We hold that ethical practices, compassion and skilled judgment are central values for our practice.